When it comes to my hair, I'm pretty much willing to try anything to give it some extra oomph and make it look more full than it actually is. See, I have a lot of hair, but it's very fine and very straight so it tends to just fall flat. I've pretty much tried everything to get it to look a little more full and luxurious and I'm always looking to try new things. 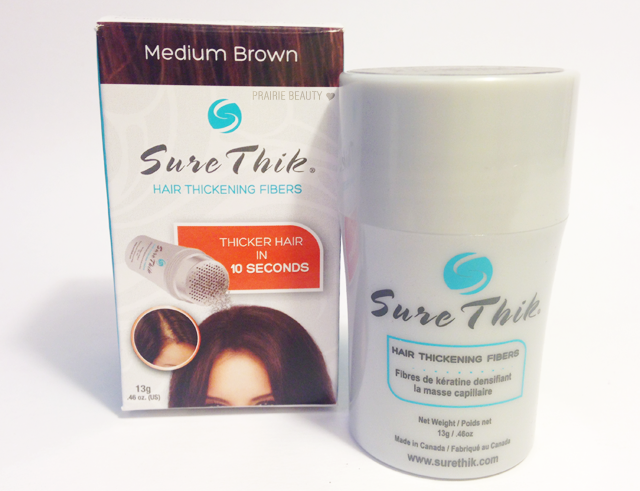 SO of course when I got the chance to try the Sure Thik Hair Thickening Fibres*, I was completely in. I was in for a bit of a surprise... but not a bad one at all. Keep reading to hear about my experience with this product! Sure Thik® is a unique complex of organic keratin protein that has been precision cut with a laser into tiny micro sized fibers. These microscopic hair fibers build upon your existing hair to produce dramatic density, volume and total coverage. 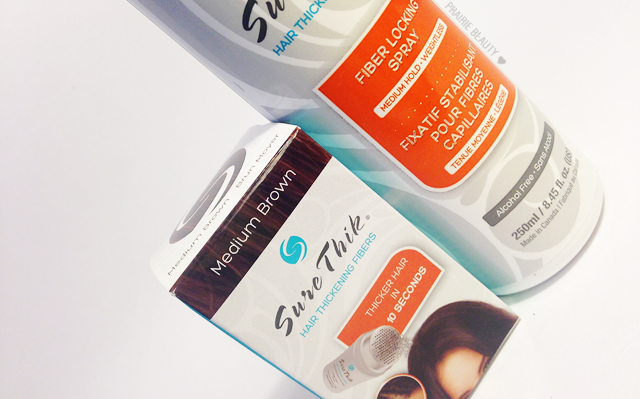 Sure Thik® is made from the same organic keratin protein as your own natural growing hair. It is completely safe and an all natural solution for both men and women. So, this actually didn't end up being what I was expecting it to be. I was expecting it to be more like one of those volumizing powders that gives your roots some lift, but what this actually does is gets up in there and gives the appearance of thicker, fuller hair at the roots by disguising the areas of the scalp that show through your hair and make it look thinner. Ultimately, this gives the look of much thicker, fuller hair in a really natural looking way. My favorite thing about this product is how quick it is to use. 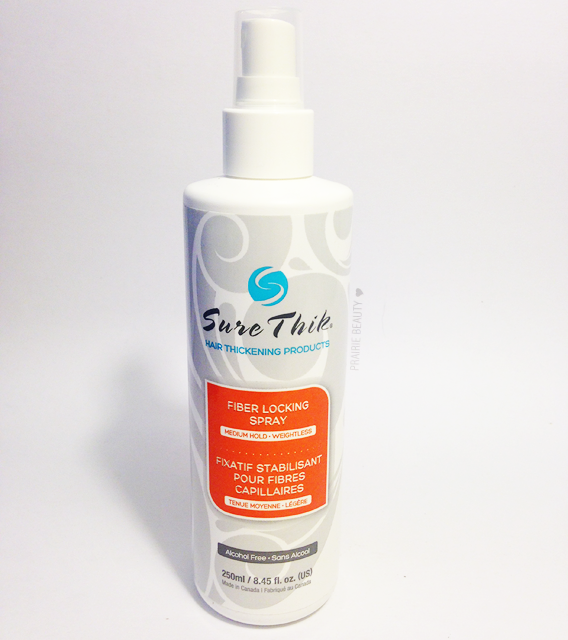 All you have to do is shake it onto dry hair and then brush it through before setting it with the fibre locking spray. One tip that I would absolutely give is to be conservative with how much of the spray that you use, because if you use too much it can end up looking a little weird. I would recommend holding it a good several inches away from your head so that the mist can disperse somewhat. I find that using this technique gives you really beautiful, full looking hair. I used my boyfriend for the before and after pictures, because he has significantly thinner hair than I do and I really wanted to show how much of a difference it makes on thin hair. 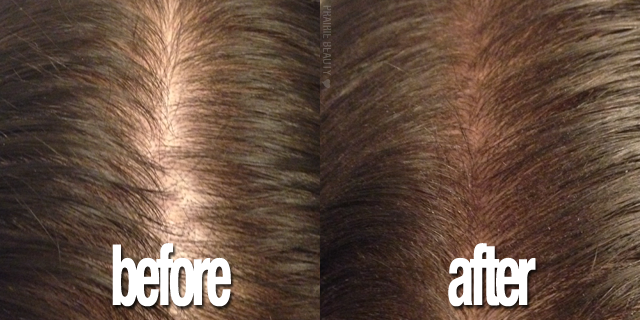 It really does give the appearance of having much thicker hair than you actually do and it's super easy. I feel like the pictures kinda speak for themselves. Tapping this into your part really gives your hair a fuller, thicker appearance. I also think this does a really good job of making a ponytail look fuller on those of us who tend to struggle with those spots where your hair looks a little thinner than you'd like as you pull it back. Honestly, if you struggle with thin or thinning hair, this is definitely a product to look into to help make your hair look fuller and thicker in a way that looks really natural. Sure Thik Hair Thickening Fibres are available in shades for every hair colour at Farleyco, London Drugs and select Pharmasave, Guardian, IDA, Pharma Choice and Value Drug Mart stores!